Satellite Industries believes in science-based innovation. As the world's largest manufacturer of portable sanitation products, the Minneapolis-based company conducts in-depth research before every product update. Case in point: their recent reformulation of Safe-T-Fresh, a line of scented deodorizers for portable restrooms. Each new scent was backed by rigorous R&D. So, when Satellite arranged to announce their new formulas at a key industry trade show, they decided to display a visible symbol of their science-focused approach: a giant inflatable microscope. That's when Satellite Marketing Director Mitch Mooers turned to Landmark Creations. "I happened to Google inflatable microscopes," he reports, " and surprisingly found an image of one. It fit my need exactly, and so I made the purchase. Landmark did a great job delivering on time and making some good suggestions for customizing it to our needs." 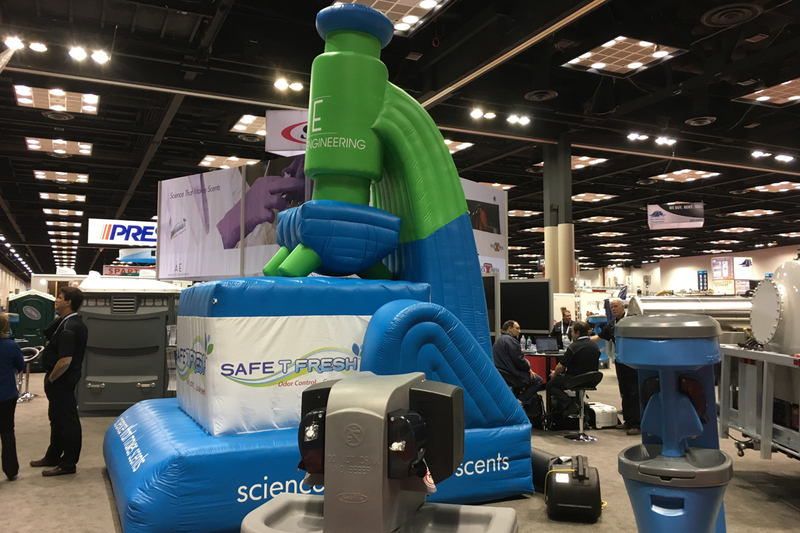 Standing 15 feet high, the custom inflatable boldly displays the Safe-T-Fresh slogan: "Science That Makes Scents." And, at the recent trade show, it certainly made an impression. "It was a colorful, large advertisement that fit with our message," says Mooers. "It was definitely noticeable, and we had better than normal sales." Satellite is pleased with the results. "We thought the microscope would stand out," relates Mooers, "and make the point about the science behind our enhancements." Apparently, it did just that.